Herbert then passed the business on to his son Wilfred and the family tradition of supplying the finest locally farmed meats continued. As the market town of Kirkby Lonsdale grew over the next century so did ‘Dales the Butchers’. 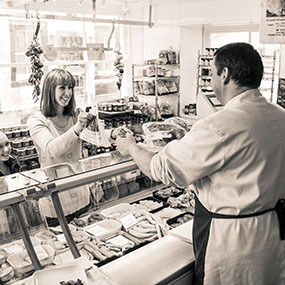 Since Mark took over in 1999 Dales has blossomed into one of the North Wests most popular family butchers. As well as our unrivalled range of quality meats and poultry we also supply a mouth watering array of award winning pies, sausages, puddings, cheeses and vegetables to the locals and the tourists who return time and time again. However our reputation precedes us and we now also supply many of the more discerning pubs, restaurants and hotels with our award winning fayre both locally and as far away as London. Whether you want simple advice on how to prepare a Sunday roast or flawless catering for a big event or wedding visit Dales……you’ll never be disappointed.